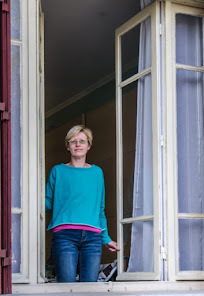 For years I dreamt of a "bit of earth" and when we moved to Versailles my fantasy was realized, first in the garden of our rental apartment and later when we bought our house. A decent-sized lot was a requirement (I could care less about the size of the house) as was a layout with possibilities: small and large spaces, shade and light, trees and shrubs; and room for fruits and vegetables. That was a lot to ask for but the property we purchased has all that if I plan and plant it right. My time in Japan has both inspired and instructed me. The gardens here are amazing and they provide clever solutions that apply to my garden at home: How do I get the maximum effect out of the space I have? 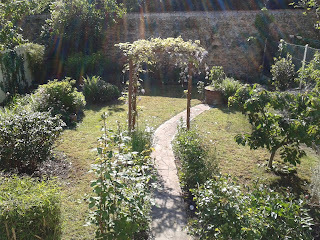 In the front of my is house a small rectangular courtyard which gets sun in the morning and shade in the afternoon. It was separated from the street by a horrible chain link fence covered in blue plastic and a very nice maroon metal gate. Here is what it looked like back in 2012 after I got rid of the weeds. The blue plastic went to the dump. We had the chain link fence painted maroon to match the gate and I also painted the concrete brick walls. After amending the soil I started to plant a few things every year. Here is what has been accomplished so far. Better but still a work in progress. The house is very close to a busy street and the noise and pollution are a big problem. M. (our house sitter) planted a row of shrubs along the chain link fence which (interestingly enough) is a plant that comes from Japan: Aucuba japonica. We chose this shrub because it's an evergreen with lovely foliage and because there is already a row of them growing insanely fast in the backyard and they are lush and green with no hint of disease. The next phase is to plant more small trees like Japanese maples (there is already one on the other side of the courtyard and I'm waiting to see if it does well) and/or alders and/or witch hazel and a few box shrubs (or perhaps azaleas) so that there will be a mixture of tall and short things that provide a beautiful multi-layered screen against the dust and noise. Another idea I have is to pull up some of the flagstones and put a small tree in the middle of the north side for yet another beautiful barrier against the street. It was in Japan that I really got a feel for how to place and prune trees for a small space. The rule I have lived by ever since I read Cass Turnball's works is never plant anything that you can't allow to grow to its full height and width. Well, the Japanese don't do it that way and their way works and looks fantastic. 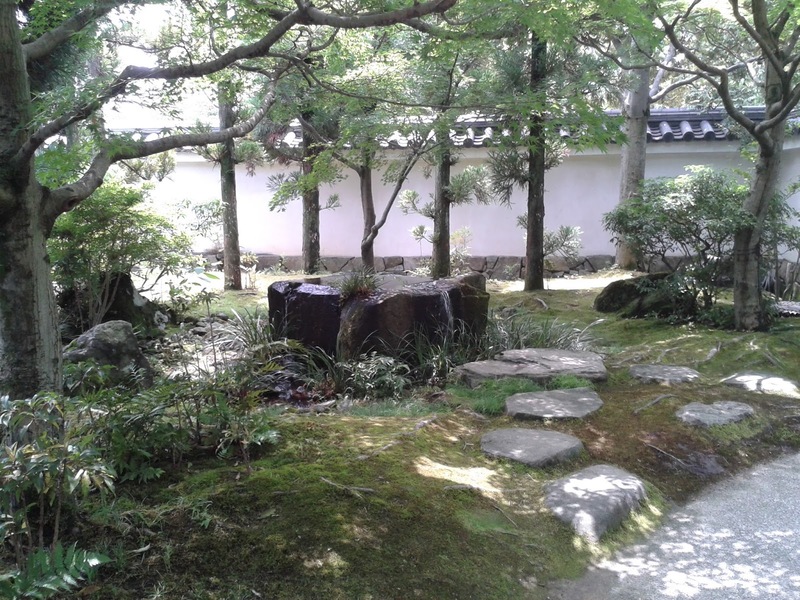 I have walked gardens in Himeji, Hiroshima, Shodoshima, Kyoto, Tokyo, Wakayama, Sapporo, and Osaka and have taken countless pictures of how they pruned in particular spaces and what trees were used to create certain effects. Two books I have read and would recommend to you are The Art of Creative Pruning: Inventive Ideas for Training and Shaping Trees and Shrubs and Niwaki: Pruning, Training and Shaping Trees the Japanese Way. Both are by Jake Hobson. Turning to the backyard garden this is what it looked like when we moved into the Versailles house. Messy but filled with potential. A garden with great "bones". Note on the right side of the photo the diseased shrubs. In the back right corner what looks like a shrub was actually growth coming out of a tree stump. 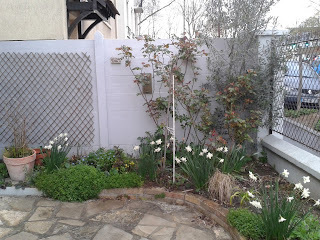 But along the back stone wall there were roses and muguet which said to me that this garden was wonderful once. The first step was one of subtraction - everything that was dead and dying had to go and it took months. Only then could I amend the soil and start adding. Slowly. A few things a year. So much to do and it's all doable with sweat and blood (I cut myself often). And affordable if I just spend enough hours on Le Bon Coin. 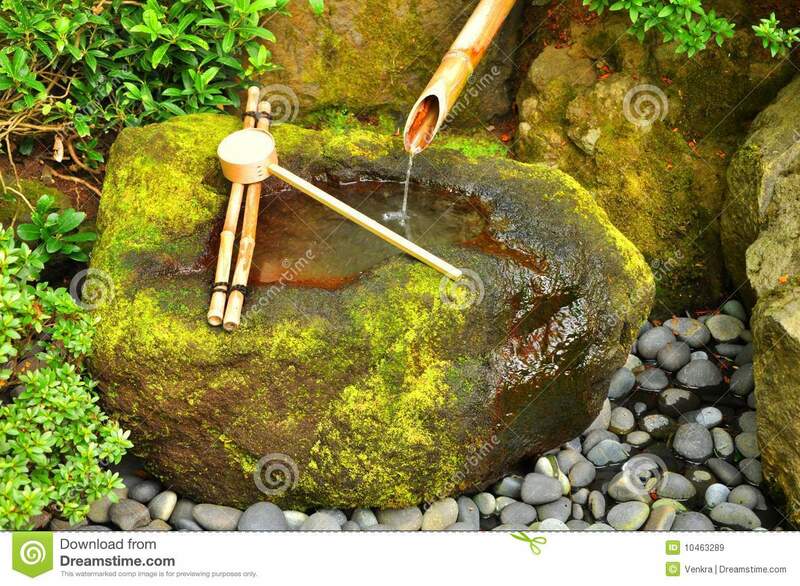 But I am so grateful to have spent time in Japan and to have had my old ideas about gardening challenged. And to be abundantly clear, I don't want a Japanese garden. What I want is a garden with the best and most locally appropriate ideas from the three countries I've called home: the United States, France, and Japan. 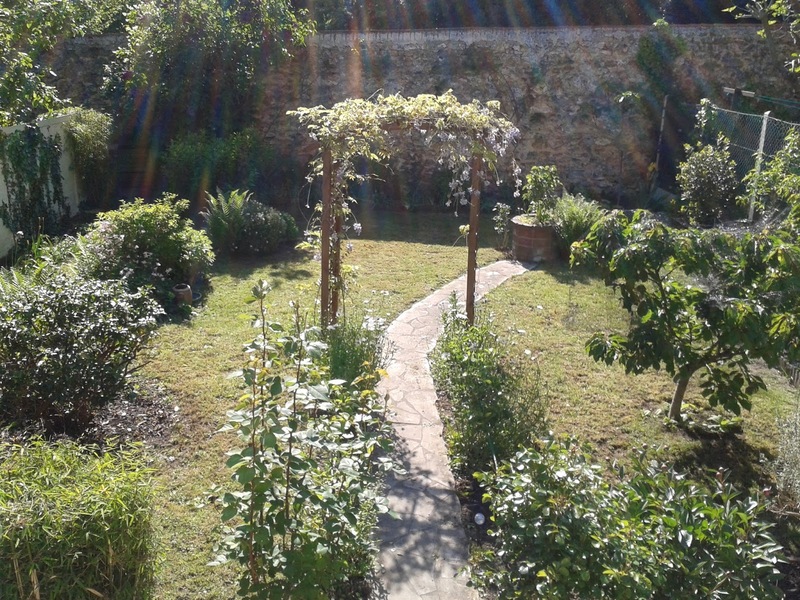 I want it to be the best "bit of earth" it can be - a transnational garden from an old transnational gardener. And just for fun (since it's Friday) here is a short clip about my favorite garden in Japan: Kokoen Garden in Himeji. If you have only one thing to see in that city, skip the castle and go to see this garden divided up into nine spaces that are so beautiful that each and every one will make your heart sing. "Chain migration is the process by which one immigrant is admitted to the country, then he or she sponsors relatives back home to come to the U.S., who in turn could sponsor more relatives. In other words, under current U.S. immigration policy, admitting one immigrant to the country who can sponsor family members can set off a chain reaction that swells immigration numbers." Lately "chain migration" has been in the US news and the context of course is immigration reform, in particular DACA (Deferred Action Childhood Arrivals). As the definition above shows, chain migration is being framed as a problem associated with family reunification policies. Oh my goodness, let one immigrant in, give him or her legal status (residency or citizenship) and suddenly the entire family has an open door to move to the US. Aside from the fact that family reunification in the US is not so simple (and this is true in more and more countries), the above definition of chain migration is misleading in so many ways. Chain migration can be about families but it's also about transnational networks. And that definition is incomplete because it presumes that the chain is all about the immigrant and says nothing about other factors that made emigration likely for other individuals. Chain migration is about networks - ties between a home and host country. If we look at yesterday's post Burke's arrival in Japan and getting the job she wanted was a very deft use of a migrant network. The ties need not be familial all all; they can be professional, academic connections or friends and friends of friends. (Maybe even just Facebook friends.) Look at your email contact list and every one in another country is a connection to that place. Some of my best contacts come through Alcoholics Anonymous which has a community in just about every city I've ever lived in. Multiply these connections by thousands or tens of thousands and they become very significant. It's the folks already in place (and they can be either migrants/expats from your country or local citizens with connections to it) in contact with people on the other side of a border somewhere and using those contact to seek opportunity while mitigating the risks associated with migration by inspiring or helping them. Sometimes even the dead are a kind of connection. It's not unusual for Americans in France or Japan to cite the influence of Ernest Hemingway or Lafcadio Hearn as being instrumental in their decision to come to Paris or Tokyo. Having a relative (a live one) in the host country who is a citizen is sometimes very helpful but it is not necessary in order for chain migration to occur. Undocumented residents and mixed communities of citizens, legal residents and sans papiers can and do offer a kind of sponsorship to friends and family seeking to enter a country. So the focus on families and chain migration is overstated in my opinion. Chain migration is real but it's so much more than just family. Stopping it (if that is indeed what you desire) involves a lot more than limiting family reunification. People are, after all, free to talk with one another. They are allowed to write and publish books about their experiences in the host country and explain how they managed to migrate and make a life for themselves. They can even offer a spare bed to a friend of a friend until he finds his feet and a job. Stopping the chain means limiting or stopping the information flows that are circulating all over the world even as we speak. My second point is that every migration chain has a beginning. It doesn't just kick off of its own accord. The very first migrants to come are sometimes called pioneer migrants because they are the ones who pave the way for others to follow. But why do the pioneers leave in the first place? This is where chain migration gets very interesting because a lot of things can start a chain or kick one into high gear. Things like war, for example, or occupation. According to the Migration Policy Institute in 1990 there were around 45,000 Iraqis in the US. By the year 2000 there were 90,000 Iraqis living in the US. In the 2016 Census Bureau report Place of Birth for the Foreign-Born Population in the United States they estimate that there are now 222,000 Iraqis in the US. Some were refugees but others were marriage migrants (not necessarily an easy road but soldiers did marry local men and women) or they were sponsored by contacts and allies in the US. "Military wives have arrived from many of the countries in which the U.S. has had troops, including Germany, Japan, and Korea. In some cases, a military presence has led to a country becoming a major source of female marriage migration. After the World War II, for example, the U.S. kept two large military bases in the Philippines. By one estimate, about half of all the immigrants who came to the U.S. between 1946 and 1965 arrived as wives of U.S. military personnel (Riemers 1985)." And then there are the other Americans abroad, the civilians. There are about 7 millions Americans living outside the US and countless others who go as tourists or students. While they are abroad they make friends, find spouses, adopt which also can sustain a a chain of migration. Most of the people I know abroad are married to non-US citizens. All the spouses are aware that moving to the US is a possibility though the folks I know haven't or won't exercise that option. In short chain migration doesn't start with an immigrant who becomes a citizen who sponsors her relatives for entry into the US. It starts well before that with contacts, connections, voices long dead that still speak to us today and the presence of a country's citizens in a foreign country. There are around 300 million native-born and naturalized Americans in the US and every one of them has the potential to be part of a migrant network and has the right to leave the country and return. The activities of the government abroad and the creation of a permanent American presence (military or civilian) abroad are also factors in creating or sustaining immigration. And yet, it seems that very few people want to admit that there is a link between American citizens, the global communications network, US military interventions and migration. Another case, I think, where people prefer to place responsibility for the immigration "problem" firmly on the backs of the migrants with the citizens themselves portrayed as the innocent victims of the "hordes" of people trying to crash the gate. Nonsense. Not when they were the ones to unlock the gates of globalization in the first place. My time here in Japan has one fatal flaw: no garden. Yes, there are gardens everywhere to admire, but there is not one bit of earth here I can call my own. At moments like these, it heals the heart to live vicariously though someone else's experiences. Cutting Back: My Apprenticeship in the Gardens of Kyoto by Leslie Buck was all that for me and more. If you are a migrant/expatriate and a gardener, I think you will love this memoir. And for those among you who aren't particularly enchanted by the finer points of Japanese pruning techniques, I would still recommend it for insights into the Japanese system for training craftsmen and women. Buck is from California and when she left for Japan she was 35 years old and the owner of a landscaping company in the United States. She had studied under Japanese craftsmen living in the US and had a portfolio of her work. This is a definite advantage that craftsmen and artists have because they don't have to rely entirely on language; they can actually show what they have done. How she managed to get the apprenticeship in Kyoto is illuminating. Much of it was about using a Japan-US migrant/expatriate network. Through one contact she found a place to live in Kyoto. Through another master gardeners from Japan living in the US gave her names and letters of introduction. A very kind woman at an party translated her cover letter into Japanese. Another contact introduced her to a neighbor in Kyoto who spoke English and owned a landscaping company. And yet another person went with her on an interview as a translator. Her approach, which was a combination of persistence, determination, and humility, was successful and in the end she had two offers. The power of a transnational network? Absolutely. How did she make her choice between the two companies? One was very tempting because the company was close to where she lived in Kyoto and the owner spoke English. The other was a very well-known company but it was much farther away and she was told before she interviewed that no one in the company spoke English (something that turned out to be false by the way). She chose the harder road and became an apprentice at the Uetoh Zoen company. And it was hard in so many ways. What makes her book a cut above many other expat memoirs is how forthcoming she is about her many mistakes and things that she found particularly difficult. She was integrated into a hierarchical, all male work crew and since she was the latest arrival, she was almost at the very bottom of the hierarchy. The work itself was physically taxing (6 days a week) and sometimes very frustrating because there was almost no spoken guidance given. She was given a tree to prune and if she did well, she was given another. If she did poorly, she was yelled at and told to start hauling brush. Learning was 90% observation and 10% negative verbal feedback. She writes, "Working with the men was a codependent's dream job! The company hierarchy kept the momentum going. No one stopped to discuss a plan. You do as you're told, or guess and accept the consequences." Among the many things she found odd was the requirement that she wear white gloves when working. If you've ever gardened than you know that anything white will turn grey within the first hour. The boss of the crew mocked her when she tried to get away with reusing her gloves. All of us migrants/expatriates have experienced these moments when something just doesn't make any sense to us and we search for why the culture asks this of us. Buck did, in my view, exactly the right thing which was to obey and buy a pack of fresh white gloves at the store. And only then did she attempt to make sense of it. Her conclusion was, "By asking me to wear new white gloves every day, I think Nakiji was trying to teach me that if I act like a premier craftsperson, I might feel like one." That may or may not have been true but her after-the-fact reaction feels more like an attempt to rationalize obedience. Here is a strong independent woman needing a reason to put aside her own thoughts and beliefs and performing an act of humility when faced with a cultural difference. The nadir of her apprenticeship occurred toward the end when she was temporarily assigned to another crew. It was snowing and when the crew broke for lunch they climbed into the truck to warm up and eat and the crew chief handed her a sandwich and told her she had to eat outside by herself. "Fine, I thought spitefully, I can adapt to this situation, like all the other workers would. I ate my lunch with my back turned to the men, my silent protest." Cold, wet and physically exhausted she was in that state of cultural confusion where one begins to imagine all kinds of nefarious intentions on the part of the natives, she stubbornly sat there even when a woman came out from the nursing home and invited her to come inside. When she wouldn't move the woman brought her a cup of hot coffee. "As I sipped my cooling cup of coffee with lovely, icy snow falling around me, the woman came out again to retrieve the cup. I looked at the ground so she couldn't see my tears. But she kept saying something to me over and over. I finally looked up. I must have looked a sight. I watched her expression turn from polite friendliness to horror then to tenderness in the space of a second. She understood... I struggled not to feel ashamed. Surely she must have understood my determination to act strong, like a dedicated craftsperson. But deep down, I felt expose and overly sensitive. What I believed was our female pact, to suffer in silence, made me cry even more." I think many of us woman migrant/expatriates can relate to this experience though our reactions and actions might have been different. When entering another culture a woman has to find a way to fit that does not do deep damage to her deepest self. Buck was fearful from the very beginning that she would be treated differently because she was a woman and she went to great lengths to prove that she could keep up with the men. Being yelled at, for example, was (she was told) a good sign: "You'll be lucky if your boss yells at you. That means you're being treated like one of the guys, not an outsider." Buck wasn't asking for positive special treatment, but here was a situation where she was experiencing negative special treatment: isolation from the crew. Was she treated this way because she was a woman, a foreigner, or just the lowest person in the hierarchy? Buck didn't know a culturally appropriate response to what was happening. And that is a situation I have encountered many times in my workplaces in France. What actions can you take and which options are not acceptable? Only time and observation can give you answers. Watch what men and women actually do (and not what they say) in order to solve the riddle of gender relationships in the host country workplace. A really fine book. I have not written nearly enough about the gardens and how hard it is to make a Japanese garden look "natural." There is every bit as much work as there is in a formal "unnatural" garden like Versailles. "We picked up every last pine needle by hand. On top of that we cleaned up a gravel area around a sitting bench, per Nakiji's request. All he had to do was point and grunt. 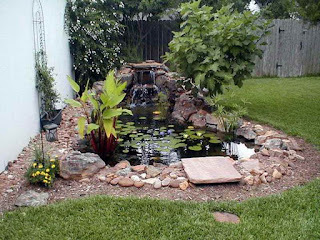 I knew instantly that the area wasn't up to his standards, that I would have to grab a bucket, move the rocks aside, square foot by square foot, dust the ground and replace the rocks." The great Japanese gardening classic (Sakuteiki) says that nature is the guide but the act of creating a garden is one of interpretation, not re-creation. Gardening is a craft and an art. And I think there is an analogy here to integration. The culture is the guide from which we take inspiration but we ultimately are the interpreters. I like this notion much better than the one that says culture is static and something to be bullied into learning by rote. Because as every landscape, every garden, is unique, so are we. Over the past year I have been paying attention to a national scandal here in Japan that is centered around a kindergarten here in Osaka. (The school is not far from where I was biking a few weeks ago along the Yodo River.) The larger context of the scandal is the emergence of nationalist movements which are provoking debates over Japanese identity. The scandal was not so much about the curriculum (though criticism of it abounds) as it was about anti-foreigner comments by school officials and corruption. The corruption is said to have occurred when the Japan government sold a piece of land to the school's owners at a very good (some say ridiculously low) price so they could construct an elementary school . The bigotry was discovered in letters and pamphlets issued by the school with statements like, “The problem is that people who have inherited the spirit (of Koreans) exist in our country with the looks of Japanese people” and reports that the school administrators were espousing belief in the "uniformity of the Japanese race." And for the cherry on the top, the school's principal is a member of a Far Right organization called Nippon Kaigi (The Japan Conference). Lest you think that this is a marginal organization with few members, think again. Nippon Kaigi is reported to have around 38,000 members but more importantly it enjoys strong support from the prime minister, members of his cabinet, and parliament. Here is a short video from France 24 in English about the organization which I think is fairly balanced reporting. Looking beyond the title of the piece, The Return of Japan's Imperialists, Nippon Kaigi members are interviewed and give their side of the story. This is a classic modern battle over national identity, one that is very similar to such debates going on elsewhere. The tactics are also very familiar: revising the curriculum, arguing for a different interpretation of historical events, creating a top-down movement led by political and social elites, and using religious, philosophical or ethical systems to support a return to an older (and ostensibly better) framework of national values. (And here I deftly avoid the question of whether or not Emperor worship is a religion.) It reveals a belief that it is possible to construct a different national reality through institutions, the education of children, and persuasive efforts led by political elites. And it makes me wonder to what extent these tactics, even in a democratic society, are a way of circumventing the wishes of the citizenry. I do not see great enthusiasm for the prime minister's commitment to a more militarized society and yet, he seems to be moving forward anyway. Ultimately, the big questions for me are: How successful is this movement likely to be? In other words, is Japanese national identity going to change significantly in the near future as a result of neo-nationalism? (Perhaps it has already changed in some ways.) And, if so, how might it change citizenship laws and immigration policies? Or to put it another way do migrants and naturalized citizens have good reasons to be very concerned about where this might go?